In "The Adventure of the Copper Beeches," we're treated to a range of emotions and reactions from Sherlock Holmes. The opening scene is one of those Canonical gems: Outside, there is a thick fog, while inside, we see a cheery fire, the gleaming breakfast table, and an eloquently irritable Holmes with his cherry-wood pipe, expounding upon art and detection just long enough to bring us up to the arrival of his attractive and interesting young client. We have a plethora of information about Holmes's personality in not only this opening, but the story itself: his annoyance with Watson and the general public, his charming way with female clients, his thinking, and the age-old question of whether he was attracted to Violet Hunter. Hop on board with us as we explore the glimpses we have of Sherlock Holmes in "The Adventure of the Copper Beeches," the story that originally appeared in the Strand Magazine in June 1892 and was the final story in the Adventures. Narrator: [00:00:02] Welcome to Trifles, a weekly podcast about the Sherlock Holmes stories. Clive Merrison: [00:00:08] It is of course a trifle but there is nothing so important as trifles. Narrator: [00:00:14] Yes the beeches were copper, of the pince-nez was golden, and the blaze was silver, but there were so many other details to pick apart in the stories. Narrator: [00:00:25] You know the plots, but what about the minutiae? Have you ever stopped to wonder about the difference between Holmes's pipes? Or how often he smoked cigars versus cigarettes? Or what Egyptian cigarettes are like? Denis Quilley: [00:00:38] You are very inquisitive Mr. Holmes. Jeremy Brett: [00:00:41] It's my business to know what other people don't know. Narrator: [00:00:45] Scott Monty and Bert Wolder will have the answers to these questions and more in Trifles. [00:00:58] Episode 17: Glimpses of Holmes in the Copper Beeches. Scott Monty: [00:01:06] Hi and welcome to Trifles - that Sherlock Holmes podcast about all the little details and the Sherlock Holmes stories. I'm Scott Monty. Burt Wolder: [00:01:17] I'm Burt Wolder. Scott Monty: [00:01:18] And here we are at the end of April. Is it here already? It seems like we were just at the end of March. Burt Wolder: [00:01:25] It seems like it just started, oh well. Scott Monty: [00:01:27] My goodness, my goodness. Well, if you're binge-listening, God bless you. And it's not good for the ears to do that you really should wait at least a week in between episodes - doctors recommend. Burt Wolder: [00:01:42] Yes. But binge listening qualifies you for a binge donations. Scott Monty: [00:01:47] That is true. So get on over to SherlockHolmesPodcast.com and click on that Patreon button or the PayPal button, if you would care to support us. E-mails and advertising and sound file hosting and transcription services -- all of this goes into the cost of running this little show. So if you can do your part, that would be very helpful to us. And while you are there, while you are online, go to the listening platform of your choice whether it's Stitcher or Spreaker or iTunes or IHeartRadio or Google Play and leave us a rating or review to let other people know what you think of the show. And as always your comments here are welcome. You can reach us at: ihose.co/trifles17. That is the URL for the show notes for this episode. Scott Monty: [00:02:49] And in this episode we are talking about the Copper Beeches. This is one of those wonderful iconic stories in the Canon. It originally appeared in The Strand Magazine in June of 1892. And it was the final story in the series that became The Adventures of Sherlock Holmes. And chronologists have had a little bit of debate about this story. It's clearly in the spring they can all agree on that. Watson says early spring but we get anything from March through May and any years ranging from 1885 all the way up to 1891, really bumping up against Holmes and his run-in with Professor Moriarty which we just talked about in the previous episode. Burt Wolder: [00:03:40] Well we prefer to think of it in April, which is one of the reasons why we're talking about it in April and Baring-Gould's chronology put it at April of 1889. Scott Monty: [00:03:50] I like that. I think that works just fine. And again you know in I think it was Episode 14: The Speckled Band, we talked about that iconic opening. And again we have one of those here with the Copper Beeches we've got a thick fog happening outside. We've got a cheery fire. We've got the gleaming breakfast table which of course Watson is seated. And then you've got Holmes. Who is who is eloquent and irritable at the same time. Burt Wolder: [00:04:35] But this is another wonderful moment. You know that you would call today the meta moment, where the characters in a particular tale comment about the way their adventure is portrayed with the public. And Holmes, as Watson says, "picked up the long cherrywood by which he was I wont to smoke when he was in a disputatious mood," begins by criticising or commenting anyway about Watson's portrayal of his cases "You have erred perhaps in attempting to put her in life to each of your statements, instead of confining yourself to the task of placing upon record that severe reasoning from cause to effect which is really the only notable feature about the thing." And they go and they go on for a considerable time to have a discussion about... Watson's reporting abilities. Burt Wolder: [00:06:27] Now this is this is what we would call in modern terminology meta. This is a very meta kind of thing to do that you're referring to the physical publication the actual circulation that hits the streets within the confines of the story which also happens to peer inside that publications. And this is something that isn't unique to this particular tale you know. Conan Doyle use this technique again and again, which as we mentioned before, this added to the confusion of the general public. Is Sherlock Holmes real or fictional? Burt Wolder: [00:07:06] Yeah but you know, we started the episode by asking for comments. And here's the case where Sherlock Holmes refers in this conversation to comments that were likely received about some of the original adventures because he says to Watson, "You can hardly be open to a charge of sensationalism, for out of these cases which you have been so kind as to interest yourself in, a fair proportion do not treat a crime in its legal sense at all. The small matter in which I endeavored to help the King of Bohemia, the singular experience of Miss Mary Sutherland, the problem connected with the man with the twisted lip, the incident of the noble bachelor. Well these were all matters which are outside the pale of the law. But in avoiding the sensational I fear you may have bordered the trivial." And that is just so remarkable. The details in that well constructed couple of sentences there what's packed in there now. Scott Monty: [00:08:03] It really is. I mean there's just this one and these one or two pages the introduction of the Copper Beeches gives us so much information or just a just a window into Holmes's personality. And some of the things that they may have talked about on any given day. This happened to be upon the day that a client was visiting them. But it really gets you into some of the background of of this friendship. Burt Wolder: [00:08:31] But also the the lovely thing is he goes on to criticize the readers. Scott Monty: [00:08:36] Yes. Yeah. Burt Wolder: [00:08:38] Watson says well you know I think you know these stories have been really novel and interesting and Holmes says, "Oh what do the public - the great unobservant public, who could hardly tell a weaver by his tooth or a compositor by his left thumb, care about the inner shades of analysis and deduction? But indeed..." And then of course we get to the story because he says well "if you're trivial, I cannot blame you, because...criminal man has lost all enterprise and originality. As to my own practice has is probably degenerating into recovering lost lead and and giving advice to young ladies because I've touched bottom" and look at this letter that I have. And of course it's the note from Violet Hunter. Scott Monty: [00:09:21] And if you've had the opportunity to watch the Granada version of this for Jeremy Brett, I think it's one of the better episodes in the series. This of course was the debut of Natasha Richardson in the role of Violet Hunter. And the derision with which Holmes greets her after having this morning spat with Watson -- and it was portrayed extraordinarily well between the two actors David Burke and Jeremy Brett. Miss Hunter is welcomed to the room. She's sitting by the table. Holmes and Watson are also seated nearby and Holmes is referencing the letter and as if to completely manifest the level of divisiveness that he has -- the derision that he has for her. He tosses the the paper, spinning it in the air toward the table as if to say 'I'm washing my hands of this' and then he turns his head and puts it in his hand. Just a marvelous representation of that prickliness by which Holmes was certainly affected in the opening of this story. 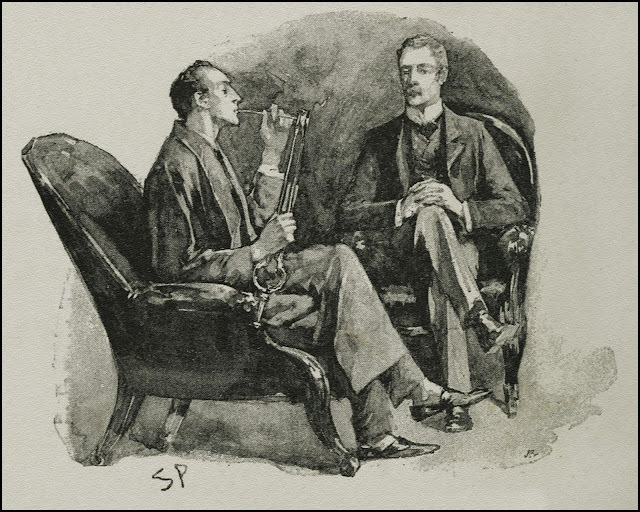 And this disputation -- Watson mentions that Holmes always chooses his his cherrywood pipe when he was in a disputatious mood. Why? What about cherrywood would connect it with disputatious versus a clay pipe or say a churchwarden or something? Burt Wolder: [00:10:57] Well it's a good question -- clearly it's a long pipe you know so I don't think there's anything in the actual smoking experience of a cherrywood that would push one's attitude this way or that way, but it's clearly a long pipe and unlike a churchwarden which can be clay or refers to a long briar pipe a cherrywood pipe would have a thicker stem and it also be probably far from cherry, so you're more free to wave it around like a baton or pointed at people. That's always what I thought. Scott Monty: [00:11:35] Well that's a good point. That's a very good point now it would have nothing to do with the with the mouthpiece though. Burt Wolder: [00:11:42] Right now at the end of the mouthpiece particularly in the 19th century it would have been horn or amber or I guess an early form of hard rubber bakelite. But no, it wouldn't have anything to do with the actual part you'd put in your lips. Scott Monty: [00:11:56] But that that wild gesticulating would have been accommodated by a longer or thicker stemmed pipe. Burt Wolder: [00:12:06] Yeah or would have had it would have had a stem of cherrywood probably and would end it at a different tip and you'd be more free to point it around and wave it around than you would with something that was more fragile. Scott Monty: [00:12:16] That makes sense. Burt Wolder: [00:12:20] The lovely thing about this you know is that unlike. Well first of all this is so archetypal in terms of the stories here is a woman alone in mysterious circumstances and another and one of the first of the many Violets we'll encounter in the stories. But she begins immediately by getting to the point: "You will excuse my troubling you, I'm sure," she says. "But I've had a strange experience. And as I have no parents or relatives from any sort from whom I could ask advice I thought perhaps you'd be kind enough to tell me what I should do." Well, Watson says, "I could see that Holmes was favorably impressed by the manner and speech of his new client." And he looks over in searching fashion proceeds to hear her story. Scott Monty: [00:13:05] Now and in this case I think he had great respect for Violet Hunter -- this woman who was was on her own was carrying herself very well and simply came to him for some advice. He was a little confused as to why she should be consulting him, but she said she should go down to the Copper Beeches firmer in mind about things. Burt Wolder: [00:13:35] Well, she you know she tells him the whole story and says you know it ends by saying basically what do you think. And he says, "Well, Miss Hunter, if your mind is made up, that settles the question. Scott Monty: [00:13:45] Right. And of course there came that key phrase. Watson notes, "As to Holmes, I observed that he sat frequently for a half hour on end with knitted brows and an abstracted air but he swept the matter away with a wave of his hand when I mentioned it. 'Data! data! data!' He cried impatiently. I can't make bricks without clay. Burt Wolder: [00:14:11] Right. Well before that you know right at the end of that little interchange with Violet she says well you wouldn't advise me to use would you. And he says in another great telling remark, "Oh I confess that it is not the situation which I should like to see a sister of mine apply for. Scott Monty: [00:14:29] That's right. Burt Wolder: [00:14:30] And of course we know from Conan Doyle that he [Conan Doyle] had several sisters. I think all of which all of whom were with governesses at different times in different places. Scott Monty: [00:14:42] And at the end of that data data data paragraph Watson said, "And yet he would always wind up by muttering that no sister of his should ever have accepted such situation." So great admiration for this woman and almost seeing her as a peer as as an extension of the family because he probably saw something of himself in her -- that independent streak. Holmes may well have may as well have been an orphan by virtue of the way he conducted his life. So would it have been that dissimilar from Violet Hunter. Burt Wolder: [00:15:20] And the other the other lovely thing in this particular story is that eventually they go down to Hampshire. And previously we've seen interesting things happen in Holmes' train travels particularly in I believe "The Naval Treaty" when are you going back to London and Holmes remarks about "the schools -- the boarding schools, the beacons of hope the lighthouses." Well here, Watson is pretty happy to be out of the fog of London out in the countryside and he sees comments to Holmes about "the little red and gray roofs of the farmstead peeping out from the light green the new foliage." It's a beautiful description. "Are they not fresh and beautiful?" And Holmes says, oh Watson, "you look at these scattered houses and you were impressed by their beauty. I look at them and the only thought which comes to me is a feeling of their isolation, and of the impunity with which crime may be committed there." "Good heavens!" "Oh they always fill me with a certain horror. It is my belief Watson, founded upon my experience, that the lowest and vilest alleys in London do not present a more dreadful record of sin than does the smiling and beautiful countryside." "You horrify me, Holmes. Clive Merrison: [00:18:06] Is of course a trifle, but there is nothing so important as trifles. Narrator: [00:18:11] Please join us again next week for another installment of Trifles. Show notes are available on SherlockHolmesPodcast.com. Please subscribe to us on iTunes and be sure to check out our longer show. I Hear of Sherlock Everywhere, where we interview notable Sherlockians, share news, and go into even more depth on certain topics. Peter Barksworth: [00:18:33] You take my breath away, Mr. Holmes. Colin Jeavons: [00:18:37] It's those busts again. Jeremy Brett: [00:18:39] Correct, Lestrade.